Porsche could be introducing a new Boxster sandwiched between the GTS and Spyder. A few weeks ago, we got our first look at the new Porsche 718 GT4 Touring. Compared to other models in the 718 family, we noticed the two exhaust pipes were more spread out. Now, our spies have spotted what appears to be a new version of the 718 Boxster with the same exhaust and sound as the recently spotted 718 Touring. In contrast, all regular 718 Boxsters have the dual exhaust tips positioned next to each other in the middle of the rear bumper below the license plate. While all current 718 models utilize a turbocharged flat-four engine, this suggests Porsche could be working on a new six-cylinder Boxster that will slot between the GTS and the Spyder. According to our spies, the Boxster prototype being tested out in the cold was fitted with a PDK transmission, while the 718 GT4 Touring spotted earlier this month had a manual gearbox so it looks like Porsche wants to offer the best of both worlds. What we don’t know at this point, however, is whether the new six-cylinder versions positioned below the GT4 and Spyder will utilize the same specification of the flat-six engine. If so, the naturally aspirated 3.8-liter unit will allegedly produce around 420 horsepower. Also expect the new six-cylinder Boxster and Cayman to be lighter than the GTS and receive additional hardware tweaks. 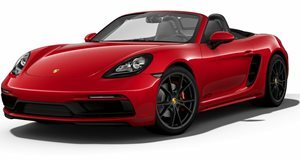 As a result, we’re expecting Porsche to charge a premium over the Boxster GTS, which currently starts at $82,800 and packs a 365-horsepower turbo-four engine. Rumors suggest the new 718 Cayman GT will be unveiled in July at the Goodwood Festival of Speed, so its twin Boxster sibling will also likely be unveiled alongside it.